When I heard that the Chinese Benevolent Association was organizing a night market, I applauded the effort. After visiting the Waterfront Night Market in Toronto last year, I started thinking about how something similar could be replicated here – though we don’t have the same level of density or Asian population numbers, Edmonton makes up for that lack in spirit! What I didn’t know was that the CBA was planning to pull this inaugural event together in just over a month, after the idea came up at the Chinatown Unveiled Conference that took place in May (something I’m more than just a little sad that I only heard about after the fact). As a result, I didn’t know what to expect as a final product, but I’m happy to say that the results should be commended! I was among forty or so volunteers who helped on the day. 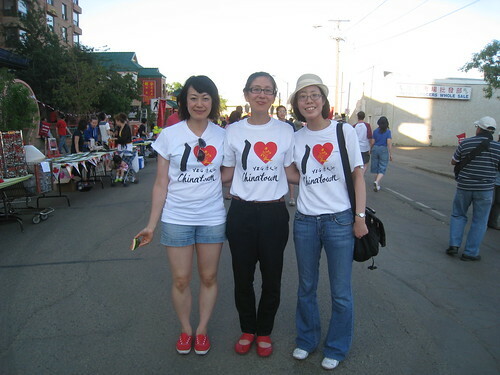 We were all given (and proudly wore) “I (heart) YEG Chinatown” t-shirts. It will be interesting to see whether or not others embrace this logo as readily as others have taken to “I (heart) #yegdt”. 102 Avenue from 95 to 96 Street was closed for the event, which ran from 4-9pm. The Lingnan Express anchored the west side of the street, and offered location-appropriate spring rolls, pork dumplings and crack chicken. 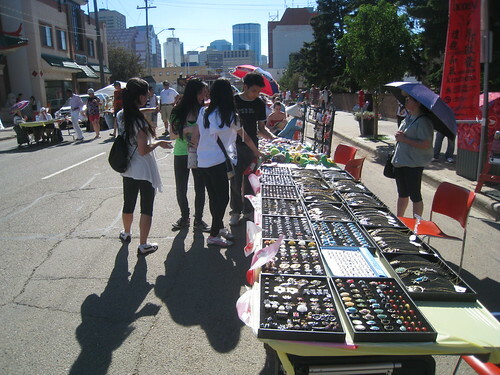 More than a dozen vendors lined the rest of the street, selling wares ranging from art, jewelry, tea, and small toys. On that scorcher of a day, I’m sure tents would have offered a welcome reprieve from the beating sun for both merchants and shoppers alike. 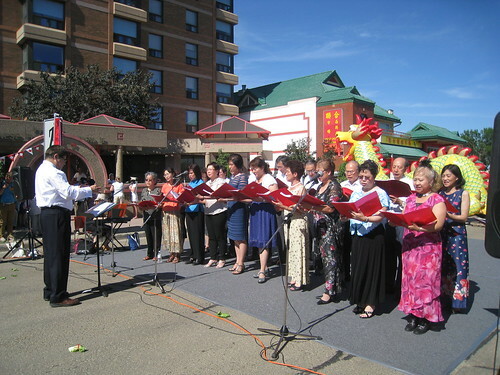 A stage was set-up on the east end of the street, and a continuous program offered five solid hours of performances, including martial arts demonstrations, Chinese dancing, choir songs, and spoken word poetry entertained the solid crowd. 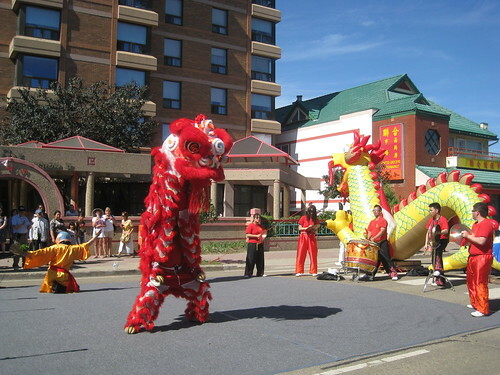 And ever the scene-stealer, there was not one, but two lion dances! I’ve seen my share of lion dances, but they always manage to stop me in my tracks – I love the spectacle of noise, colour and drama. 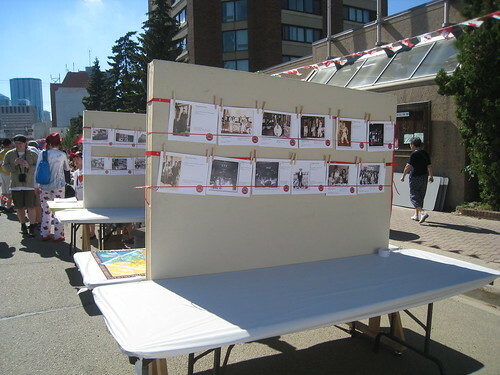 The event also managed to incorporate a bit of history, with photographic displays of Chinatown past and present. Though organizers had to scrap the walking tours due to the short lead time, they did distribute pamphlets for self-guided walking tours of notable locations. 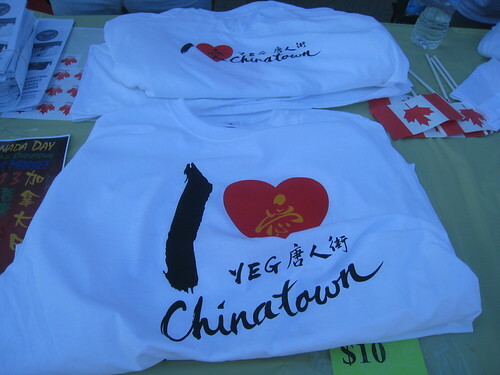 As a first time event, I think the Heritage Chinatown Night Market was very well attended! It was especially wonderful to see many generations on the street – Chinese and otherwise! 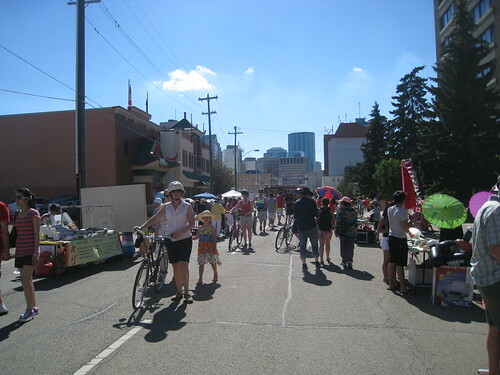 Given the plethora of Canada Day attractions available in the city and beyond, it was a coup that so many chose to stop by the market – I think it speaks to the need for more events like this! As my fellow volunteer Kathryn pointed out though, events at that very site won’t be possible in the near future. 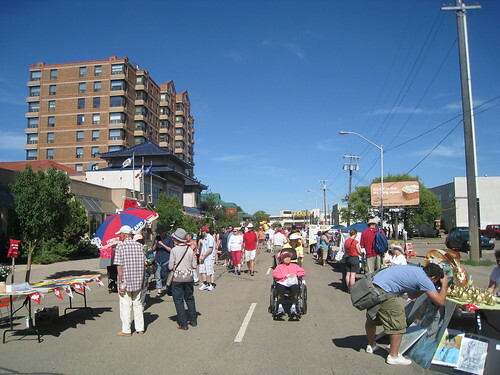 With Downtown LRT Connector construction set to start as early as 2015, organizers intent on this night market becoming an annual one will have to contend with some location pains. 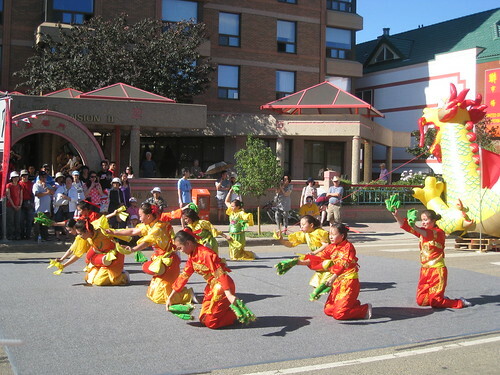 Bravo to the Chinese Benevolent Association for a well-executed event! For those who may have missed out, you may be interested to know a few of us are working on a follow-up night market to take place later this summer. Stay tuned for the details!